An unfortunate thing happens shortly after this issue in Batwoman's history: the New 52. For those not in the know, this was a line-wide reboot of DC Comics. After #863, Batwoman departs the title, ostensibly for her own series, but only a zero issue is published before everything is rebooted. And, for some reason, I never followed the reboot. Honestly, the New 52 left a sour taste in my mouth about DC that I've only recently got past with the Young Animal titles. So we get a sort of team up between the Bats, though they don't really interact much in today's issue. They're pursuing different cases, as far as I can tell, but you know with these sorts of things, everything will likely come together. Then again, maybe it won't. 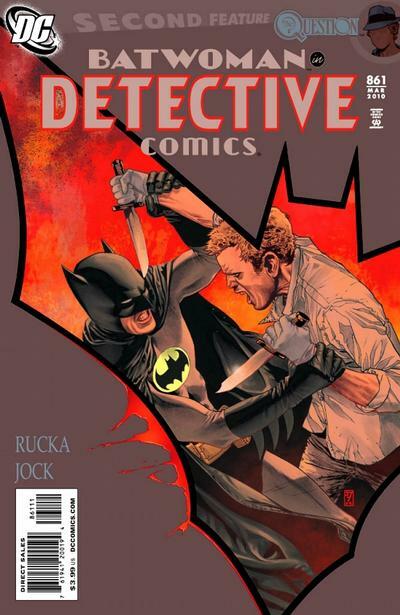 Mr. Rucka is a pretty smart writer, so perhaps the ending I'm expecting won't be the one I get.